This letter is slightly shorter than normal because we have spent quite a lot of the week preparing for our Christmas Nativity. This week we have enjoyed reading lots of Christmas stories, thank you to everyone who brought a story in to share with the class. These have started lots of discussions about different Christmas traditions and how people celebrate Christmas. This week the children have been thinking about how to be a good performer during our Christmas play. I really hope you enjoyed watching your child perform and I am sure you will agree that they all did a fantastic job. We have also been talking about the celebration of Christmas and what that means for us and our families. Thank you to everyone who has kindly brought in a decoration for our Christmas tree, we have enjoyed showing these to our friends and talking about why they are special to us. We have been busy developing our fine motor control this week, cutting out trees and paper chains. The children have also been busy using stampers to create their own pictures. We have been ordering numbers this week, using our number baubles and comparing numbers. We have also enjoyed weighing baubles, talking about heavy and light and how we know which side of the scale is the heaviest and which is the lightest. This week we have been writing our letters to Father Christmas, using our phonics knowledge to help us sound out the letters in a word. We had to think about the format of a letter and how we should start and finish our letters. In our phonics sessions we have learn the sounds ‘l’ and ‘h’. This week we have been busy continuing to decorate our classroom, we hope you liked the baubles’ that the children made. Towards the end of the week we have also started to make our Christmas cards which we will be sending home at the end of next week. We have continued to learn about the Christmas story this week, talking about why Mary and Joseph went on a donkey to Bethlehem and how Christians believe this happened a long time ago, we have also been thinking about how life was different in the past. Towards the end of the week we have been discussing how Christmas is celebrated in different parts of the world. Phonics keyrings are in your child’s homework folder. They have all the sounds that we have covered so far, plus the two sounds we will be learning next week. Please could you send in your child’s keyring on the first day of next term and we will update them. From then on keyrings should be in your child’s book bag at all times so that we can add each new sound to them when we need to. Tuesday- We are going on our trip to the Botanical gardens, all children need to wear school uniform. They will also need to wear a warm coat and wellingtons, Every child needs a packed lunch as well because we will not return in time for lunch. Wednesday- We will be having our Christmas party with the year one and two children. Please could your child bring in something to change into during the afternoon. Children need to come to school in uniform but can bring their own party clothes to change into during the afternoon. Thursday- We will be joining the rest of the school for the Christmas carols in the hall at 2.30pm. You are all welcome to come and watch. Friday- School will finish at 1.15pm for the Christmas holidays. Phonics homework- Just to remind you to take the old phonics homework sheets out of your child’s homework folder. You only need to return the ones from the previous week to be marked. WOW leaves will be shared next Friday and celebrated. We will then send home new wow leaves in your child’s homework folder for the start of next term. We will be making Christmas cards and reindeer food as well as preparing for our Christmas party. 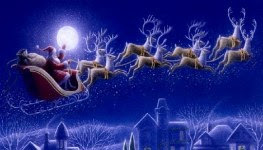 Father Christmas is very busy at the moment but what do you think he does when it’s not Christmas?